If he had wanted to, Lars Nyberg, president and chief executive officer of TeliaSonera, the Stockholm based telecoms firm, could have put the mobile phone in the cupboard, got out the comfy slippers, and taken retirement in December 2011. Nyberg, however, appears to have unfinished business at TeliaSonera, as in 2010 he agreed to the board extending his employment contract, as President and CEO, to December 2013. Scandinavia has a history of pioneering development in the telecommunications sector and TeliaSoneria is a product of that spirit of innovation. The firm was formed from the 2003 union between Swedish telcoms firm Telia, and Finnish firm, Sonera. Both firms have a distinguished business history although neither started life with a snappy marketing friendly title – Telia was originally the Kongliga Elektriska Telegraf Verket, while Sonera began corporate life as the Post and Telegraph Office. Nyberg and TeliaSonera originally connected in September 2007 when Nyberg was appointed CEO. 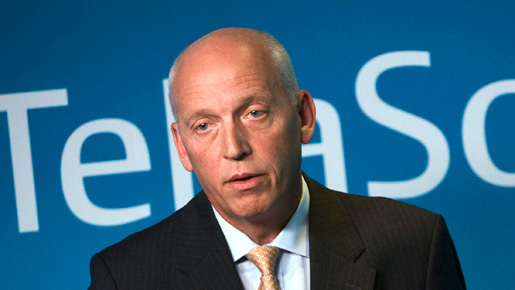 Prior to that he spent two decades with Philips Electronics NV in numerous roles, notably as chairman and CEO of Philips’ Communications Systems Division. After Philips, he joined tech firm NCR Corporation, holding the CEO position there from 1995 through 2003 – he remained as non-executive chairman until 2005 – and helped the firm navigate its spin-off from AT&T Corporation in 1996, and its return to profitability. TeliaSonera has three main strands to it business operations. Through its mobility services it offers mobile communication services, including mobile telephony and mobile data via mobile phones or laptops in the Nordic and Baltic countries. The firm’s broadband services arm provides communication and entertainment services to homes and offices. And there is Eurasia where, for example, TeliaSonera has majority-owned operators in Kazakhstan, Azerbaijan, Uzbekistan, Tajikistan, Georgia, Moldova, Nepal and Cambodia. Here, the majority of revenues come from prepaid mobile voice services. Nyberg stepped up as CEO of TeliaSonera just as the banking crisis began to take hold. Even then, despite the challenging market conditions, Nyberg led the company to consecutive annual increases in net sales, and a steep increase in free cash flow. In the third quarter of 2010 TeliaSonera posted record EBITDA (earnings before interest, taxes, depreciation, and amortisation) numbers. When Nyberg joined, he set about transforming what was already a good business into a better one. Initially he focused on six areas, quickly making progress on three. With B2B sales up and running, migration to IP-based services underway, and the business in Eurasia growing, the focus areas were soon reduced to three, which were, said, Nyberg, likely to be a company focus for many years to come. They were: building a world class service company and delivering a superior customer experience; securing high quality in the firm’s networks; and cost efficient operations. The company’s costs were structurally higher than the competition, so over the next couple of years Nyberg introduced efficiency measures. Tough though it was, cost reduction did include redundancies, announced in 2008 and implemented over 2009 and 2009. The results of Nyberg’s efforts were evident in the 2009 and 2010 results. Although revenue was fairly flat, cost savings in Sweden and Finland relating to operating expenditure and cost of goods sold boosted performance with improved margins and improved EBITDA margin. “One of the things I and the rest of the management team are very proud of, is that we have managed to break the trend of continuous cost increases. This is a result of major cost reductions in the Nordic and Baltic countries and tight cost control in Eurasia,” Nyberg stated. On the growth front, like many other commentators, Nyberg anticipates an explosion in the growth of mobile data and mobile broadband. Challenges remain, of course. There is, for example, the thorny issue of the proposed merger between Telia, and Russian firm Altimo’s interests in Turkey’s biggest mobile firm, Turkcell and Russia’s third-biggest, MegaFon, to create a new company. The deal has twice been blocked in the Russian courts, and the legal process is ongoing. The truth is, for all the great things that Nyberg has accomplished since his arrival in 2007, there is still plenty to keep him occupied at TeliaSonera over the next few years. The comfy slippers can wait.